Previous: Paris, Archibald C. M.
Table of Contents Next: Parker, George M.
U.S. Department of the Interio. Via Wikimedia Commons. Parker Dam (114.139W 34.296N), built between 1934 and 1938, is the deepest dam in the world, with footings 235 feet below the original bed of the Colorado River. 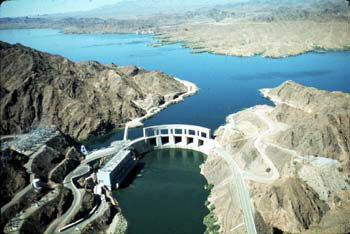 Lake Havasu, the reservoir behind the dam, stores water for the Central Arizona Project and the Colorado Aqueduct. The four generators can each produce 30 megawatts of power.